When we think of judicial activism or so-called “legislating from the bench,” we typically think of this being a modern phenomenon complete with the modern rhetoric of judges going against the will of the people to create or strike-down laws. Throughout the 20th century, many powerful court cases decided social issues at a national level, including segregation, abortion, and most recently gay marriage. Numerous politicians, from both the left and right, periodically call for the end of judicial activism; especially, after being on the losing side of a case. But we forget that judicial activism has been with us since the foundation of the Republic, and that the body of common law the Founding Fathers knew and drew from was rich in the decisions made by the courts. When most people think about judicial activism, they instantly turn to Marbury v. Madison (1803), which created the principle of judicial review. But from the very first important Supreme Court case, the courts have decided how the law should be interpreted and placed into motion a body of American common law. Chisholm v. Georgia (1793) is often considered the first key court decision from the High Court. It was also a widely unpopular decision, and gives us great insight into how the Founding Fathers would respond to modern judicial activism. Chisholm v. Georgia (1793) was one of the many cases heard in federal court resolving issues relating to the creation of the republic. In this case, Alexander Chisholm was the executor of a citizen from South Carolina who had sold supplies on credit to the State of Georgia during the Revolutionary War. Georgia had never fully repaid the debt, and the executor attempted to sue the state to resolve the debt and end the probate. Georgia, refusing to appear, claimed that it was a sovereign state and immune from being sued without its consent. But there was a serious catch with this. It was generally interpreted that the causation was limited to states bringing lawsuits against citizens of another state, and not the other way around. A dispute between A. and B. is surely a dispute between B. and A. Both cases, I have no doubt, were intended; and probably the State was first named, in respect to the dignity of a State. This laid the foundation for the ruling that the causation of Article III, Section 2 was two-way and that the people of the United States form a federal republic. As members of a federal republic, the people have certain vested rights. In a deeply divided Congress, this measure overwhelmingly passed both chambers, 81-9 in the House and 23-2 in the Senate. In just under a year, 12 states ratified the Amendment, making it a part of the Constitution. Therein lies the constitutional check and balance to judicial activism — the ability to amend the Constitution itself. If an issue is truly important enough, even a bitterly divided Congress should be able to work together to pass an amendment to override bad or unpopular decisions by the Supreme Court. It has been almost 44 years since the last amendment was ratified from start to finish in modern times (the 27th was intended to be part of the Bill of Rights). Since then, only two more have been approved by Congress, but failed to gain support from the states: the Equal Rights Amendment and the District of Columbia Voting Rights Amendment. We are in the second-longest period in American history with no new amendments (the antebellum America had a 61-year period of no new amendments to the Constitution). Like antebellum America, the nation is sharply divided politically. While North/South, Free/Slave are not the issues today, the conservative/liberal divide is at least partially geographically driven. In a truly free society, we will be unhappy with our leaders or their decisions at least half of the time. When politics are deeply divided, the courts should be able to break the gridlock and make decisive judgments. The issue of gay marriage still deeply divides America as the Supreme Court takes up the matter again in the 2015 session. 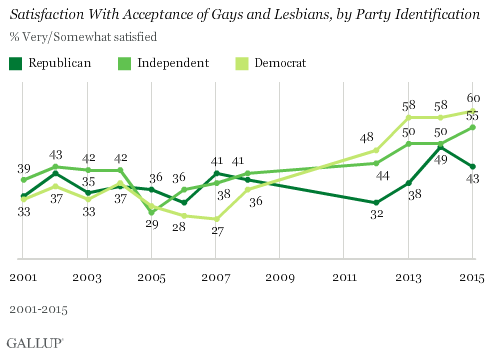 While the issue is predominately along red/blue lines, acceptance has grown by all categories over the past 15 years. There is definitely not the type of super-majority that could easily create an amendment, and it is likely that one side is going to be severely disappointed (possibly infuriated) with the outcome. The losing side will almost certainly take up the banner against activist judges once again, but when they do this, they take a risk of eliminating an institution that has created a wealth of decisions that needed to be made, but were too unpopular for the legislatures to effectively make the right decision. In a truly free society, we will be unhappy with our leaders or their decisions at least half of the time; blanket support or opposition is the hallmark of dictatorships. America already has the tools to combat judicial activism; we just aren’t facing any problems “important” enough to transcend partisan politics.